October 1962. A world on the brink of nuclear war! 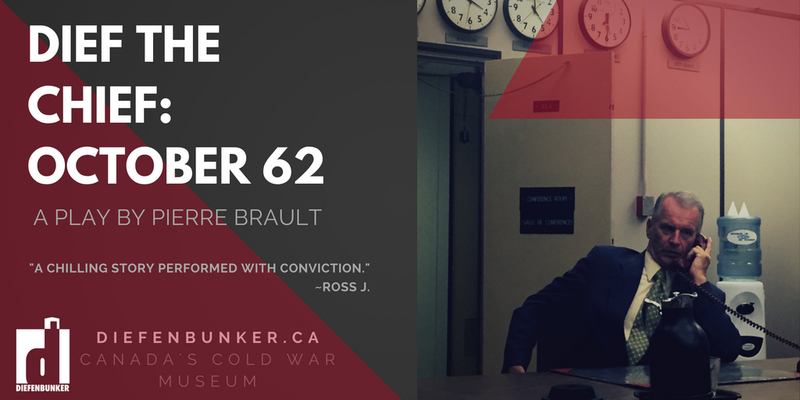 Relive the heart stopping story of the Cuban Missile Crisis through the eyes of Canada’s 13th Prime Minister, John “Dief the Chief” Diefenbaker. Travel with “Dief” through the Diefenbunker, into the war room as he and the world watch the USA and USSR face off in history’s closest brush with nuclear war. Hear in his own words how Dief’s rocky relationship with President John F. Kennedy played an extraordinary role in Canadian/ American relations and how each influenced the other’s policies. This immersive theatrical experience, written by playwright Pierre Brault and performed by Peter Haworth and Pierre Brault, is a unique opportunity to relive history and to play a part in it. Do not miss this experience. Space is very limited so book today. Please note: the play will move around to different spaces and levels underground. Please wear comfortable shoes. There will be very limited seating. Pierre Brault is a veteran actor, writer, director, and producer, whose work has appeared on virtually every stage in Ottawa and across Canada. He is best known for writing,performing and touring his multi-award-winning, historically based shows: 5 O’Clock Bells, Portrait of an Unidentified Man, and Blood on the Moon. “It was simply fantastic! It was like living through history. Pierre & Peter delivered the serious material (because it *was* serious material) with deadpan humor, nostalgia, sentimentality, and emotion. Take a few moments before (or after) the experience (and it IS an experience) to read a bit about the Cuban Missile (aka. October) Crisis to round out the history you are (or have just) seen. A must see if you can! Great job, Mr. Prime Minister & Pierre Brault.